The following article and accompanying photos are taken from a 1977 issue of International Cycle Sport and are reprinted without permission. The magazine itself folded many years ago. If anyone knows the copyright holder and they have an objection I will, of course, remove this page. His victory bid had been rather late in taking shape, for more than 240 kilometres we hoped for the impossible and as soon as he began his winning move his strength became clearly evident. He succeeded Jacques Anquetil who had been the only French rider on the list, winner thirteen years before. 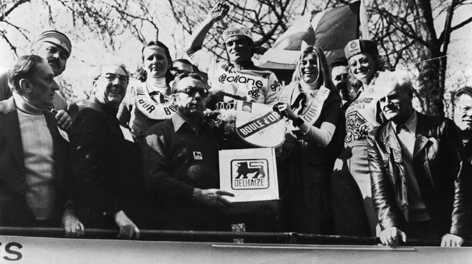 In addition since 1966 when Anquetil won Liege- Bastogne-Liege on his own and Jean Stablinski the first Amstel Gold Race, France had not won a single classic. With Hinault the run of ill-luck is ended. Though not having a great reputation, Hinault was not an unkown man. He turned professional in October 1974 and finished fifth overall in his first cash race, the Etoile des Espoirs. Finishing seventh and first Frenchman in Paris-Nice 1975 he had a fine future before him. in 1976 he won several short national stage-races, the Circuit de la Sarthe (as in 1975), the Tour d'Indre-et-Loire, the Tour de l'Aude, the Tour du Limousin and two French en-ligne events Paris-Camembert and the Prix du Chardonnay. Useless to say he was last years best French young professional winning the National Pernod Trophy. Two days before Ghent-Wevelgem, in Paris-Roubaix two punctures and a fall had got the better of him but he, like his manager Cyrille Guimard, knew he was in devastating form. The withdrawals of Maertens, Merckx and Roger De Vlaeminck really helped matters for him, and the others too, believe me! There were far more climbs than previous years in this Ghent- Wevelgem, making it as difficult an event as the Tour of Flanders. We met the participants who had on their menu 275 kilometres from Ghent to Wevelgem taking a roundabout way, in a park near the centre of Ghent. The whole Brooklyn and Fiat squads were absent as was the less famous Onderneming-Markik-Benco of Gerard Vianen and Tino Tabak. In the Flandria- Velda-Latina team Maertens' absence left Marc Demeyer, Michel Pollentier, Pol Verschuere and the ageing Albert Van Vlierberghe in charge. Despite the above withdrawals there were 132 on the start line. In anticipation of problems in the near-at-hand hills the race started at full speed. As soon as the already strung out bunch left Ghent the riders drew ahead of the race schedule under Luis Ocana's impulse. Despite this famous pace-setter Eric Leman gave the bunch the slip in company with Jacques Bossis (Gitane), two Maes' Eric Jaques and Eddy Cael and Gerben Karstens who was just re- covering from a collarbone fracture. Joining forces with two new co- escapees, Fausto Bertoglio (Jolljerceramica) and Walter Naegels (Flandria) the seven leaders built up a thirty second lead and began the first climb, the Edelaere, a long and tarmacced slope just after Oudenaarde out of sight from the bunch. But soon after the Kattenberg (46km) all was back to normal for some sixty riders. 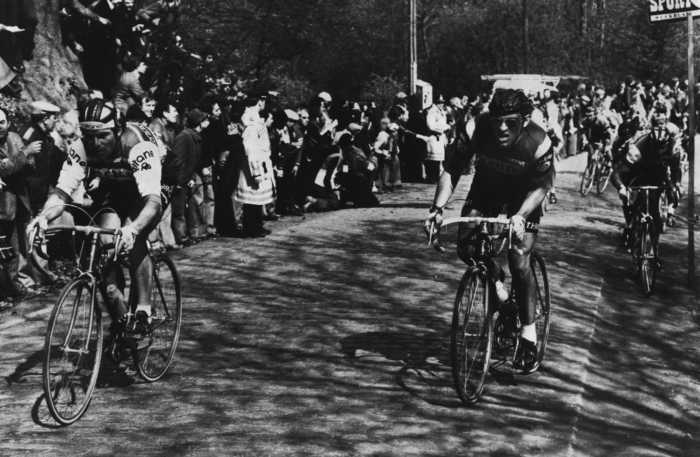 Men such as Regis Ovion and Bernard Thevenet (both Peugeot) and Hennie Kuiper (Raleigh) had to fight their way back over the Varentberg (54km), the Hoppeberg (63km), the Kruisberg (73km) the Hogenberg (77km) and then the Taaienberg (82km) to resume their place at the head of the bunch and because of their long chase were too exhausted to maintain contact with the front as they reached the feared Koppenberg (92km) and for almost half of the field it was already time to wait for the sag-wagon or to take the quicker route towards Wevelgem. Once more the Koppenberg was to play its destructive part. For the two escapees Jos Van de Poel (Flandria) and Marc Meernhout (Ebo), on their own for ten kilometres the passage was rather easy though they too died a thousand deaths just to reach the top still on their bikes, but for the chasers more numerous it was a different kettle of fish. Surprised by the gradient he climbed for the first time, Italy's Martinelli was obliged to stop near the bottom of the slope and for everybody behind him it was for the third time this season that they had to ascend cyclo-cross style with their bikes on the shoulder. We however thought that Walter Planckaert, Frans Verbeeck, Dietrjch Thurau, Eric De Vlaeminck, Andre Dierickx, Luc Leman and Piet Van Katwiijk who had widened a short gap were to carry on with their attempt but as Van de Poel and Meernhout fell back, Sibille, Jos Jacobs, Lubberding, Alfons Van Katwijk and Knetemann rejoined first. Then it was Van Springel's turn with De Bal, Beon, Ludo Peeters, Van de Wiele, Verschaeve, Lieven Malfair, Albert Van Vlierberghe, Schipper, Gavazzi, Fraccaro and Renier. Jan Raas who had suffered a lot on the Koppenberg was also with them before the Kwaremont (106km) as was Martinelli the man who had caused the clutter, Verschuere, Battaglin, Italo-Belgian Walter Dalgal and Roger Gilson, the reigning champion of Luxembourg also rejoined. The eventual winner Bernard Hinault wasn't yet ahead but was not long in coming along with almost all the other beaten - or so we thought before - riders. He merged with the strong leading group in Ronse, before the ascent of the Kruisberg (115km) where seven men hammered into the attack taking advantage of the hard slope and so Verschuere, Alb. Van Vlierberghe (both Flandria), Luc Leman, Jos Jacobs, Marc Renier (al three Ijsboerke), Eric Van de Wiele (Maes) and Piet Van Katwijk (Raleigh) crossed the Vossenhol top in Tiegerr (133km) already 2' 30" clear of the bunch from which Fausto Bertoglio had jumped away. Unable to join the breakaways alone the Jolliceramica leader, after a thirty kilometre chase, dropped back towards the main peloton. Through the Flanders plain the seven men increased their lead to 4'.05. but as the final difficulties drew near the bunch stirred itself and after 198 kilometres their advantage disappeared. Quickly Jacobs and Verschave replaced them ahead. The Kemmelberg was still to be climbed twice (a different side each time) and then it was a scurry towards Wevelgem along the French border with just 38 kilometres to go. During the first Kemmel ascent Verschaeve was left behind by Jacobs but though reaching the slippery top 1' 40" up he quickly gave up the struggle before the Mont Rouge less than ten kilometres later. Frenchman Andre Mollet was next to have a go over the top of Kemmel with the whittled down bunch in close attendance. Mollet was caught by seventeen men. From this group, Van Springel, Bertoglio, Dierickx, Thurau, Knetemann and Hinault took a flyer and collected Jacobs. The seven leaders were almost joined by the other previous members of the eighteen men group when Bernard Hinault attacked. Almost at the same time the two groups merged behind with Beon towing Raas, Dierickx, Godefroot, Schipper, Ludo Peeters, Verbeeck, Gavazzi, Piet Van Katwijk, Jaques, Cael, Vanzo, Quilfen, Vittorio Algeri, Chinetti, Lubberding and Fedor den Hertog across. Nobody had been able to cling to Hinault's slipstream. Jos Schipper, author of the breakaway which propelled ahead Kuiper, Knetemann and Raas in this year's Amstel Gold Race, tried first to close the gap but conceded to the head wind and waited for Dierickx who for a while continued on his own. Godefroot, Piet Van Katwijk, Beon, Vittorio Algeri and Teirlinck made him see reason and broke clear from the rest with Ludo Peeters also attempting to join this group but doomed to ride to the finish in limbo. Piet Van Katwijk, Godefroot and Dierickx tried to bring Hinault to heel in turn and despite our predictions to the contrary, he increased his lead. Patrick Beon, another Breton, certainly a bit jealous of Hinault staked his all in Wervik (266km) but it was too late. The new professional Vittorio Algeri countered him and was to finish second in Wevelgem but nevertheless 1' 24. behind Hinault. The Dutchman Piet Van Katwijk beat Godefroot for the third place, making a bad day for the Belgians. My closing thoughts are how strange an event this is without Roger De Vlaeminck, Maertens and Merckx. 6 A. Dlerickx (Maes-Mini-Flat) all s.t. Well done Bernard. A new star for France mounts the podium and acknowledges the crowd who were probably as surprised as the press to see a Frenchman in this exaltad position in a Belgian classic. We hope we don't have to wait quite so long for the next French winners bouquet. FOOTNOTE: Five days later Hinault won Liège-Bastogne-Liège and Merckx (6th), Maertens (5th) and De Vlaeminck (4th) were there. Could France have a new Anquetil?